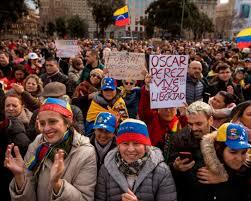 Photo of demonstration in solidarity with Venezuelans in Spain. I was deeply moved by the number of comments, tweets and emails I received in the wake of the publication of “The Bolivarian God that Failed.” My thanks goes out to Jamie Palmer there who did such a wonderful job of editing that this piece shines in ways none of my other work does. I made a reference in the piece to getting into an argument with my Chavista friends over Libya. Some thought that meant I supported the bombing of the country. I didn’t. I opposed it, knowing it would do no good for the country. I would, however, have supported a multinational force joining the rebels since it was clear that Gaddafi was going to fight to the end. And, unlike Hillary Clinton, I felt no glee at the death of Muammar Gaddafi: I was sickened by his end, and Clinton’s response. I did, however, support the Arab Spring, and I believe that the argument that it was inspired by outsiders has no merit, unless the argument is that people who rose up to overthrow the regional dictators were inspired by liberal rights most in the West enjoy (limited though they are, and increasingly under attack by populists like Maduro and Trump). I referred to Hayek because I do admire his humility, his clarity, and many of his ideas. I’ve read very little of him (The Road to Serfdom and The Fatal Conceit and a few articles), and don’t consider myself “Hayekian,” but I think he’s made a great contribution to economic thought. I sided with him in his argument with Gunnar Myrdal about how to engage in international development, for instance, as I read William Easterly’s The Tyranny of the Experts—an excellent book, by the way. But I think regulation of markets is crucial for a functional market and so I lean more toward social democracies or the type of liberal capitalism one finds in Holland than I do toward neoliberalism. I spent a bit of time in Holland in 2015 and again in 2016 and it seems to me an ideal to strive towards for the US. And a feasible one, at that. I don’t think a “military solution” in Venezuela is a solution. Period. I hope that intelligent people will talk Trump into accepting the best advice from the Strategic Studies Institute of the US Army War College and that the other countries in the region will take initiative to help resolve the crisis in Venezuela. But unfortunately, he’s making his decisions about Venezuela as he seems to make most of his decisions, advised only by that imbecile, Donald Trump. I continue to believe that the so-called “US sanctions on Venezuela” have absolutely nothing to do with the present crisis since, until just recently, there WERE NO SANCTIONS on Venezuela, but rather on officials of the regime who the US government has reasons to believe have been involved in corruption, embezzlement of state funds, drug trafficking, money laundering, etc. To people who argue that in the article I didn’t deal with “imperialism” I would refer to my book where I argue that Chavista intervention in the US was far greater than US intervention in Venezuela in simple dollar amounts. Moreover, I think Chinese, Russian and Cuban imperialism and sub-imperialism are far greater factors in the current disaster unfolding in Venezuela than US imperialism. Those are my immediate caveats and responses to comments that came my way. I’m happy to engage in dialogue whenever and with anyone who wants to talk about Venezuela in a respectful way. Which reminds me that I wanted to update the previous post where I wrote to the leftist who invited me to join a dialogue on a leftist website. They decided, in the end, that I was too far to the “right” of them for my views to have any sort of validity or to be worth publishing in their discussions. My parents were both members of CPUSA. I myself was politically involved at times in my life but not to the extent my parents were. In the mid nineties I rediscovered the American revolution and had been slowly becoming less black and white in my views. I still had a soft part for socialism in my heart, but that is gone. And it is painful, especially to think of all the stress my parents were under for all those years–and for what? It is very liberating now to be able to consider what works, from any reasonable source. It is also very embarrassing to think how I acted like those in the regressive left. I compare how I was in the sixties to the Tea Party– tear everything down. Into the vacuum that’s left march the thugs. I still find many of those on the extreme right to be more dangerous and the last election some right-wing aquaintences made this clear so I still vote Democratic. I recently joined better angels.org which is trying to get liberals and conservatives together to have civil conversations. It is good to listen to others as everyone makes mistakes.